She’s a New York Times Best-Selling author who thrives on suspense. Her suburban-based thrillers draw readers in, and keep them up late, turning the pages. She grew up in a Hollywood family of writers and in a household filled with books. Her parents wrote screenplays for classic movies like The Desk Set, There’s No Business Like Show Business, and Captain Newman, MD. She was the last of four daughters to start writing or, as she calls it, to succumb to her genes. She’s been an Edgar Award finalist and a four-time finalist for the Mary Higgins Clark Award. She’s the author of Night, Night, Sleep Tight & You’ll Never Know, Dear. as well as Writing and Selling Your Mystery Novel: The Complete Guide to Mystery, Suspense, and Crime. 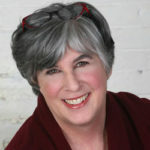 The uber-talented Hallie Ephron, joins us on the show today to talk about her latest release and her expansive career. Listen to “HALLIE EPHRON – PDI-2018 Adventure #14” on Spreaker.